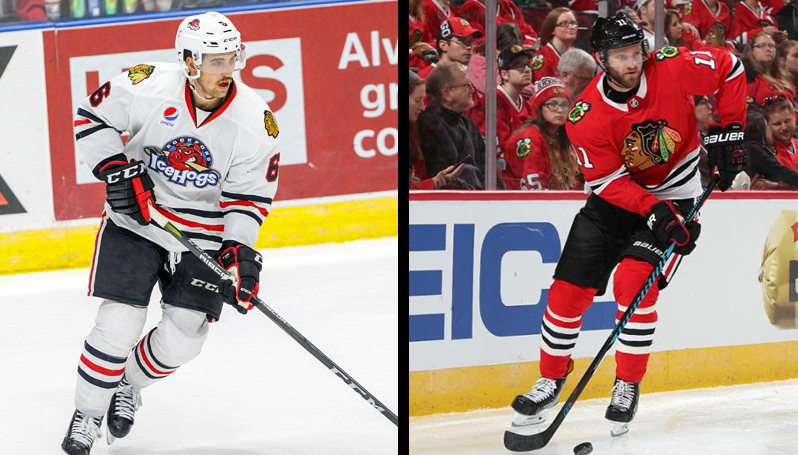 ROCKFORD, Ill. – The Chicago Blackhawks have recalled defenseman Erik Gustafsson from the Rockford IceHogs and assigned defenseman Cody Franson to Rockford. Franson, 30, has collected one goal, six assists and eight penalty minutes in 23 NHL games this season with the Blackhawks. He began the year with points in three of his first four games, posted a multi-point effort (2a) on Nov. 15 vs. the New York Rangers and scored his lone goal of the season on Dec. 2 at the Dallas Stars. The Sicamous, British Columbia native was originally selected by the Nashville Predators in the third round (79th overall) of the 2005 NHL Draft. He made his professional debut with the Milwaukee Admirals during the 2007-08 campaign and was named to the 2007-08 AHL All-Rookie Team and 2008-09 AHL All-Star Game. Franson has since spent the majority of each of the last eight seasons at the NHL level, combining for 212 points (43g, 169a) in 550 career NHL games with the Predators (2009-11, 2014-15), Toronto Maple Leafs (2011-15), Buffalo Sabers (2015-17) and Blackhawks (2017-18). Gustafsson, 25, was selected to the 2018 AHL All-Star Classic after collecting 3g-14a-17pts and 18 penalty minutes through 25 games this season. The blueliner has assists in each of his last four games and has collected a helper in six of his last seven contests since returning to the lineup on Dec. 28. Gustafsson leads the IceHogs and ranks second in the league in assists over that span. The Nynashamn, Sweden native was originally selected by the Edmonton Oilers in the fourth round (93rd overall) of the 2012 NHL Draft. He has tallied 14 assists in 41 career NHL games with the Blackhawks during the 2015-16 season and combined for 11g-47a-58pts in 120 career AHL games with the IceHogs from 2015-18. Gustafsson was named the IceHogs' 2016-17 Defenseman of the Year after pacing Hogs blueliners with his career-high 30 points (5g, 25a) last year. Next Home Game: The IceHogs take on the Bakersfield Condors on Tuesday, Jan. 23 at 7 p.m. at the BMO Harris Bank Center. The contest marks another Fas Fuel Winning Weekday in 2017-18. If the Hogs win, tickets from Tuesday’s game can be redeemed for a ticket of equal or lesser value to the following Fas Fuel Winning Weekdays game on Wednesday, Feb. 7. Fans can also enjoy $2 tacos, select beer, and companion tickets as part of Taco Tuesday. Tickets can be purchased at IceHogs.com, by calling (815) 968-5222 or in-person at the BMO Harris Bank Center Box Office.